While we await further word on the subtype and number of cases in two suspected transmission events linked to recent county fairs (see California: San Luis Obispo Public Health Investigating Suspected Swine Variant Flu Cases and Michigan DOH: 2 People Test Positive For Influenza After Contact With Infected Swine), the CDC has released a new 2-page PDF infographic on how swine variant viruses are transmitted to humans. Transmission of flu viruses between pigs and people is a two way street. 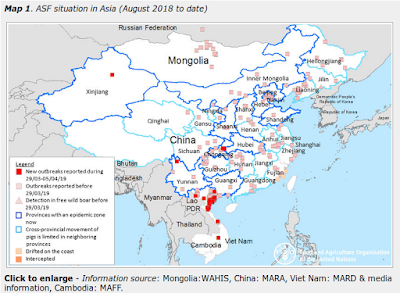 People can, and often do, infect pigs with human seasonal virus, and this has led to reassortments of human and swine flu viruses, resulting in the creation of new variants (see J. Virology: Pathogenesis & Transmission of H3N2v Viruses Isolated in the United States, 2011-2016). 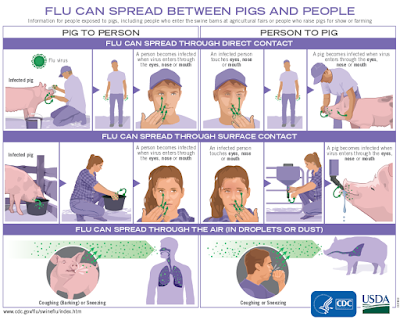 While most (but not all) people who contract swine variant influenza will experience only mild to moderate illness, and these viruses haven't (so far) developed the ability to spread in an efficient and sustained manner in the community, the CDC takes these outbreaks very seriously. While none of this (at this time) would stop me from enjoying a county or state fair this summer if I so desired, I would take the following warnings and precautions offered by the CDC and public health officials seriously. 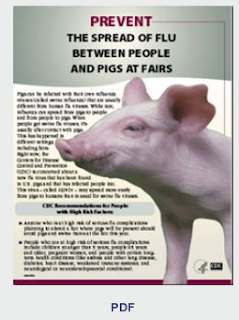 If you are at high risk of serious flu complications and are going to a fair where pigs will be present, avoid pigs and swine barns at the fair. This includes children younger than 5 years, people 65 years and older, pregnant women, and people with certain long-term health conditions (like asthma, diabetes, heart disease, weakened immune systems, and neurological or neurodevelopmental conditions). Don’t take food or drink into pig areas; don’t eat, drink or put anything in your mouth in pig areas. Don’t take toys, pacifiers, cups, baby bottles, strollers, or similar items into pig areas. Wash your hands often with soap and running water before and after exposure to pigs. If soap and water are not available, use an alcohol-based hand rub. Avoid close contact with pigs that look or act ill.
Take protective measures if you must come in contact with pigs that are known or suspected to be sick. This includes wearing personal protective equipment like protective clothing, gloves and masks that cover your mouth and nose when contact is required. To further reduce the risk of infection, minimize contact with pigs in the pig barn and arenas. With county and state fair season ramping up across the country, there's a pretty good chance we'll hear about more outbreaks such as we've already seen reported from California, Michigan, and Indiana this summer.